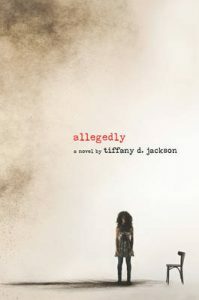 Allegedly by Tiffany D. Jackson is one of the most amazing and mind-twisting thrillers you’ll read this year! It’s thoroughly messed up — in the best possible way for a thriller. I was hooked on every word of the novel as it unfolds the story of a 9-year-old girl who allegedly killed a baby. It’s also heavily inspired by a true story (although I don’t believe this is based on the story) which makes it all the more chilling. Psychopaths have to start somewhere, don’t they? And there’s such a thing as a child psychopath. Or, in this book’s case….is there? Did she do it? The story follows Mary Addison who’s been in jail since she was 9 and, at 16, is is now released. She’s living in a group home from hell, filled with nasty vicious girls who make her life miserable for fun, and overseen by a malicious and negligent guardian who is content to let the girls abuse each other so long as no one gets murdered. Mary has no rights. She has no future. She has no hope. And she says she never killed that baby. Her life because more complicated when, while working in a community service job, she meets a boy named Ted whom she loves incredibly much and they accidentally get pregnant. Now Mary is faced with the realisation that she’s never going to be allowed to keep her baby, no matter what she says or does. Not unless she can clear her name. So the story follows her digging up the case again, even though she’s tired and beaten and despondent. She’s trying to get her SAT score so she can get into college and better herself. But only a million and two obstacles stand in her way, which makes for a completely harrowing tale because you can’t help but root for Mary to succeed — even if, all the while, you’re wondering what really happened that night the baby died. The writing is absolutely incredible! It’s poignant and rich and so real that you can’t help but feel you’re living the story instead of just reading words off a page. I could scarcely believe it was a debut with the sheer skill of the word-wielding here! And, as all good thrillers, this one never gives you all the information. Mary is an unreliable narrator, but then so is absolutely everyone. This story excels in the plot twists. You never see them coming! It makes you question the world and the justice system and humanity. I will say it’s a very hard book to read for the sheer darkness of the tale. It’s heavily spattered with abuse too, of course, from flashbacks to Mary’s childhood where she was sexually and physically abused to all the cruelty happening to her in the present day. Living in the group home literally means she fears for her and her baby’s life. And as a convicted-murderer and a black woman, she faces terrible racism and abuse at every turn for that too. The book doesn’t shy away from giving you a really brutal view of Mary’s life. I absolutely recommend this book! It is a beautiful display of talented storytelling and excellent writing and a captivating story of brutality and mystery. It talks very fiercely about how judgemental people can be and whether people deserve forgiveness. Even when I finished reading it, I couldn’t put it down after that mind blowing ending. Wow, dude, wow.